Scripture mentions the word “fire” over 600 times. What is the significance of fire in Scripture? One of the major themes that runs through Scripture is that fire is used to destroy evil and refine and strengthen the good. What are we to learn from these passages and how does it apply to us? We know that fire consumes evil, as we see in Genesis 19 with the destruction of Sodom and Gomorrah. Isaiah 30 beginning at verse 27 presents another example, “Behold, the name of the LORD comes from a remote place; Burning is His anger and dense is His smoke; His lips are filled with indignation And His tongue is like a consuming fire; His breath is like an overflowing torrent, Which reaches to the neck, To shake the nations back and forth in a sieve, And to put in the jaws of the peoples the bridle which leads to ruin.” Fire consumed the burnt offerings, on which were placed the sins of the people. “Lay your hand on the animal’s head, and the Lord will accept its death in your place to purify you, making you right with him” (Lev. 1:4). We also know that fire is also used as a purifier in Scripture, as we see in Psalm 66:10-12, “For You have tried us, O God; You have refined us as silver is refined.” Isaiah 48:10 states, “Behold, I have refined you, but not as silver; I have tested you in the furnace of affliction. What does this mean for us? How can we be sure that we will withstand the fire of affliction? When the Israelites came before YHVH, they were not to come empty handed. They were to bring some of the best of the products of their labor. One day soon we will appear before YHVH (Deut 16:16). We will not be expected to bring garden produce and animals, for these were merely a prototype of the real fruit that we are expected to produce. YHVH is looking for the fruit of our labors as workers in His spiritual harvest. How have we contributed to the building of His kingdom? We see in Acts 2:3, that when the disciples of Yeshua were baptized with the Holy Spirit, that tongues of fire appeared over each person. The Holy Spirit provides fire for us, to help us discern that which is pleasing to YHVH and that which is not. We must follow the guidance of the Holy Spirit in choosing and performing our works for the kingdom. What we deem as useful may appear only as straw in YHVH’s eyes. 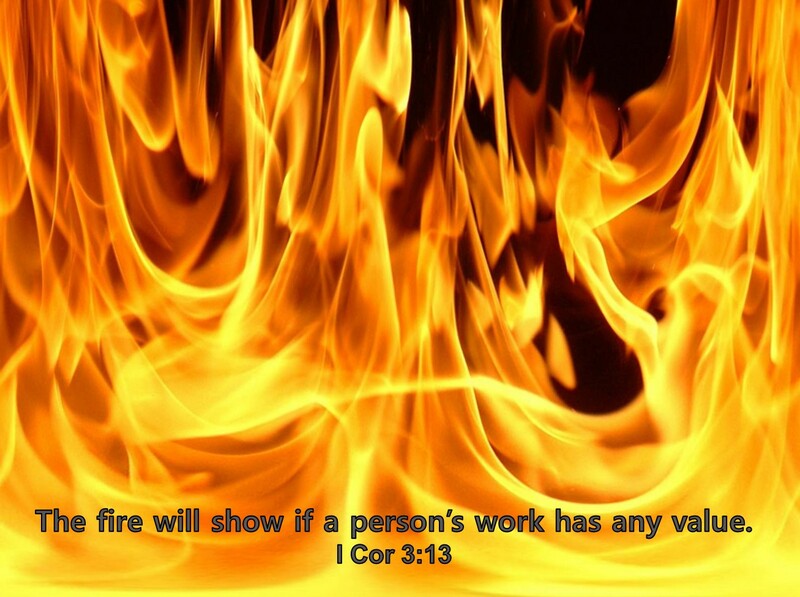 In 1 Corinthians 3:13, Paul tells us that any of our works that are deemed useless will be burned up in the fire. All we will have left to present to YHVH are the works that withstand the purifying fire. Peter also warns us about the coming fire of judgment. However, the Day of the Lord will come “like a thief.” On that Day the heavens will disappear with a roar, the elements will melt and disintegrate, and the earth and everything in it will be burned up. Since everything is going to be destroyed like this, what kind of people should you be? You should lead holy and Godly lives, as you wait for the Day of God and work to hasten its coming. That Day will bring on the destruction of the heavens by fire, and the elements will melt from the heat” (2 Pet 3:10-12). Are we choosing each day to follow the guidance of the Holy Spirit? When we follow the guidance of the Holy Spirit, we are sure to have something of value to present to YHVH. We will be sure to have works that withstand the purifying fire of YHVH. Previous PostHow can We Love?Next PostDoes God care about Genes or Jeans?